So I had to get to this new place in Adelaide, Osteria Oggi, and was having trouble getting there during the week. I was pleased to find out they’re open for lunch on Saturdays – I love weekend lunching! You’ll find Oggi on Pirie Street, close to Gawler Place. It’s brought to us by Simon Kardachi of Press/Bread and Bone/Proof fame (to name just three) – and I like all of those, so I had high expectations. So what does the name mean? Osterias in Italy were traditionally places to go for tavern-style simple food and wine. Oggi means ‘today’. You walk down past a long bar and find yourself in a large, spacious and light dining area. It has a really lovely feel to it. A tiled floor, wooden tables and chairs, some booths (ah yes, booths! ), and up a small flight of stairs is the kitchen. You can also dine in the front section where you walk in. It’s a pasta and wine bar – but don’t worry if you’re not a pasta fan – there are plenty of other things to choose from. The day I went, I was also going to Magill Estate for dinner so I really had to curb my intake (Magill write-up coming soon!). I know two dishes and a salad does not maketh a review, but it would be irresponsible of me not to spread the Oggi word as soon as possible! Given I couldn’t eat much, I suggested to my dining partner that we share a pasta and main. 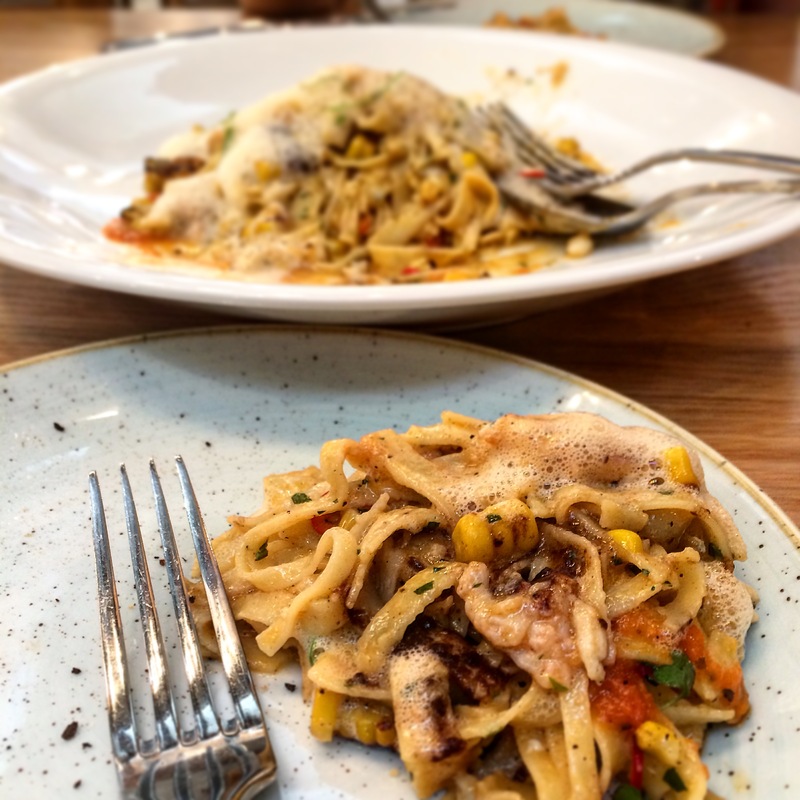 Luckily we have similar tastebuds and couldn’t go past the Tagliatelle with blue swimmer crab, blackened corn, black garlic and crustacean foam. What could possibly be better than that? Anyway, what arrived at the table was a dish that could be described by no other word but STUNNING. I had returned from Italy 4 days prior where I’d had a 2-week-pasta-frenzy, but this dish was up there with the best pasta dishes I’d had… if not…better! Beautiful and ‘seafoody’, it was rich, but the pasta was so light and there was a nice hit of fresh chilli. Ridiculously good – we both agreed. Next, we chose the fish of the day – Kangaroo Island snapper with cockles and mussels. Once again, a beautiful dish, and a good size. We were told that the chef had given us a little extra fish, bless him! I loved it. The flavours were a little similar to our pasta, but we didn’t care about that at all. To accompany this we had the Witlof and frisee salad with anchovy dressing – a very sharp dressing indeed. In short – I cannot wait to get to Osteria Oggi again. Superb food and great service to boot. Their wine list looks good too with a mix of Australian, Italian and other wines. Next time I go I’m going to have the ‘Piatti di Tavola’, a daily Oggi selection of plates to share. Bring it on!